So this is meant to replace both the wifes DD '98 100 Series Toyota Land Cruiser and my '02 Chevy 2500 tow rig, this will be her DD, my occasional tow rig for the Willys on the weekends and our adventure/road-trip 4x4. 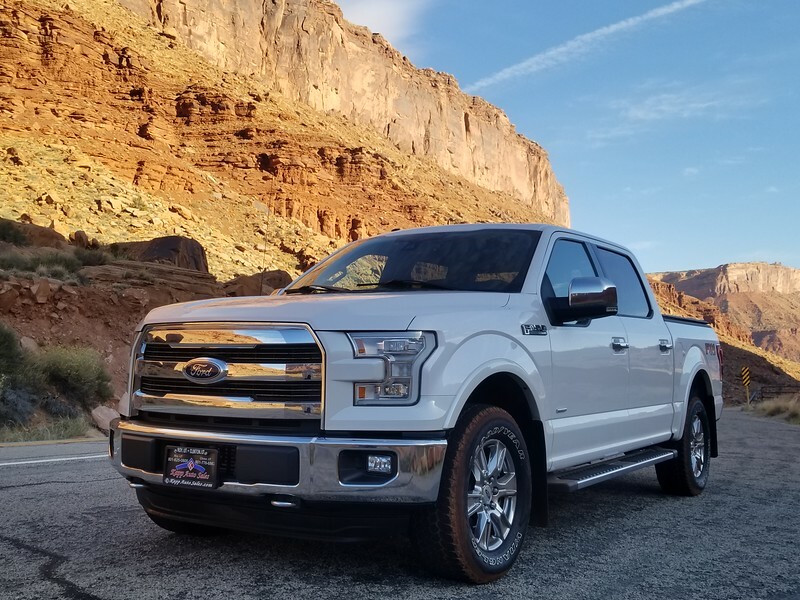 It's a 2015 Ford F150 Lariat, 3.5 EcoBoost V6, FX4 package (rear locker, hill decent assist, skid plates & offroad shocks), 36 gallon tank, 5.5' bed & has 58k miles. It has 3.55 gears, LED lighting package, etc. It's loaded, the interior feel is very high-end, which is nice when she really wanted a 200 Series Land Cruiser. It has heated and cooled leather seats, heated steering wheel, etc. We bought it in SLC and on the 250 miles drive, the mileage computer registered 21 MPG back to Grand Junction, CO (not sure how accurate it is, need to get some hand calculated numbers). Much of the driving is lower speed and Catherine always gets better mileage than I do. It has a slight coolant leak, I believe it's coming from one of the connections going into the turbo. It's a common failure, apparently. I would imagine it still has the origional spark plugs, so it'll get new Motorcraft plugs soon, too. The tires aren't great either, they're low on tread so new tires are on the list, too. We plan to do some basic mods to make it ride and tow better, with some improvements in offroad capability. It may see some dirt, but we will save the hard stuff for the Jeep. There is a chance we'll be taking the EcoBoost to Baja this Winter, so that may cause us to speed up the mods. We took the truck to Barney Brothers here in Grand Junction and had them fix the coolant leak today. It was pretty quick and easy, the part was a fitting that goes into the head, from the turbo. It cost $105 for the part and less than $200 for the labor. I don't mind paying for the work and the guys at Barney Bro's always do good work. We kinda beat up the dealer on the cost of this repair and told them I considered it a fixer-upper.... and got a good break on the price due to the leak! New Motorcraft spark plugs and air filter have been ordered, I'll install those myself. I installed the Falcon Sport Tow/Haul shocks over the weekend, leveling the truck. At the same time, I removed the lower deflector under the bumper, I think it makes the truck look better.... it was also broken by the PO. I swapped out the factory antennae with a stubby one, since the factory one hit the garage door when pulling in & out. I've been working on a OUT Adventure Trailer, from Anchor Mountain Overland and decided to take the trailer out on it's first test drive behind the F150 tonight. I finally wrapped up the majority of the work it needed to be roadworthy, and took it out for its 1st drive. 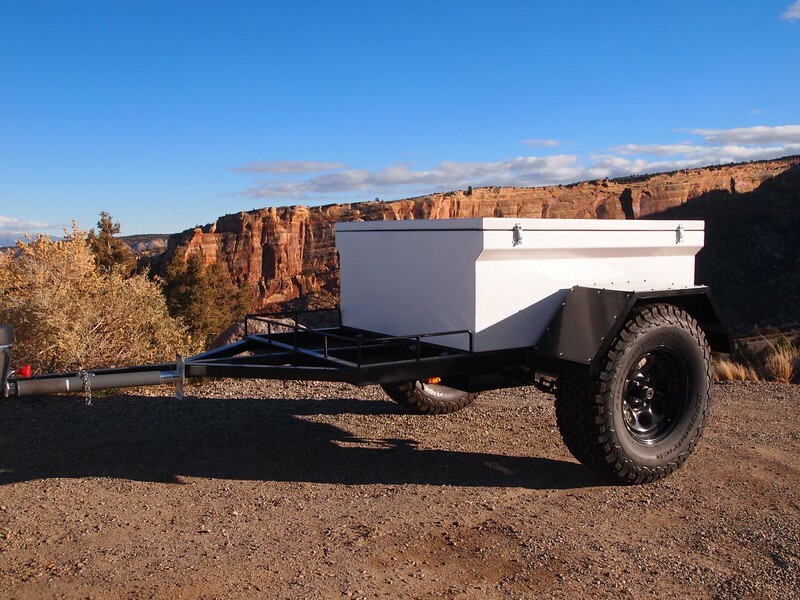 The hitch sits a little low on the truck, and I need to finish adding the struts for the lid, the rooftop tent and finish the plumbing for the 20 gallon water tent. Other than that, it's ready for an adventure! We're planning to take this setup to Baja later this month! I just test drove the V8 version of that truck, but it was red and had 70k on it. Man, it was really nice. They are spec'd out very well and seem like a great place to spend time. Looks great in white, enjoy! It's an amazing truck, I love the EcoBoost engine myself. My wife loves the interior, it's very well appointed! Ford is building some NICE trucks these days. You’re thinking of the 2.7TT. The best I’ve seen on my 2018 3.5TT w/10spd is 23.3mpg indicated on the dash. I'd chuck the running boards if you're going south. My neighbor's got an F-150 Ecoboost and went with a leveling kit and 285-75-18 Toyo AT2's. I ordered my 2016 F150 just the way I wanted it and picked it up in May of 2016. Now have over 30,000 miles on it. Change the oil is all I've had to do since I bought it, absolutely flawless dependability. 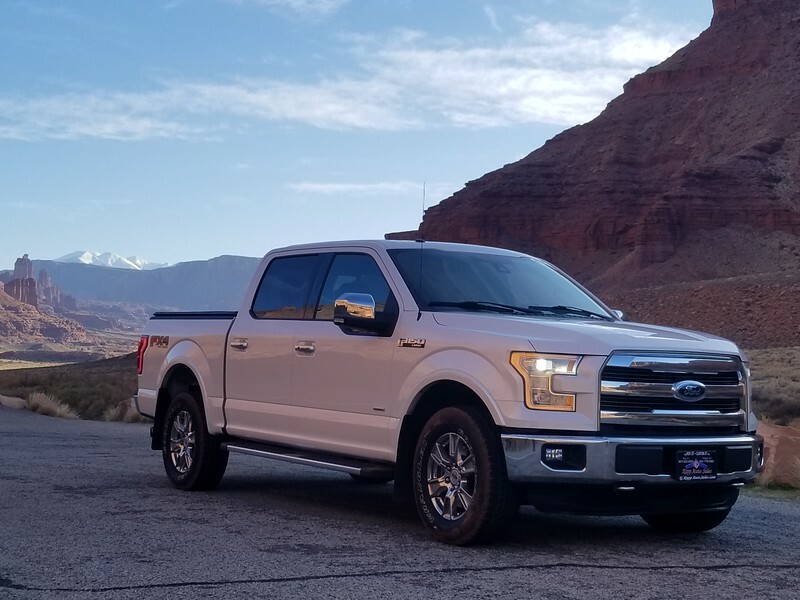 As with all my vehicles, all fuel purchases go into an Excel spreadsheet and that tells me that overall since I bought it, this F150 3.5 Ecoboost Supercab with the 6.5' bed has averaged 20.9 mpg. (My overhead display always reads high.) And that includes a lot of driving at 80+ mph...80 is the speed limit out here. Love this truck! The way it blows over the high mountain passes (7,000-11,000+ feet) without having to shift down just makes me smile! 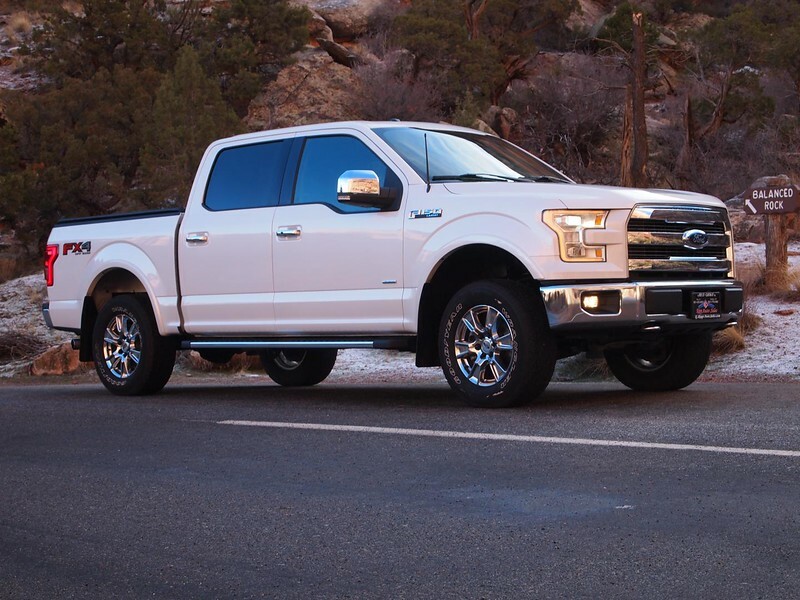 Like @Dougnuts said, you're thinking of the 2.7l EcoBoost. 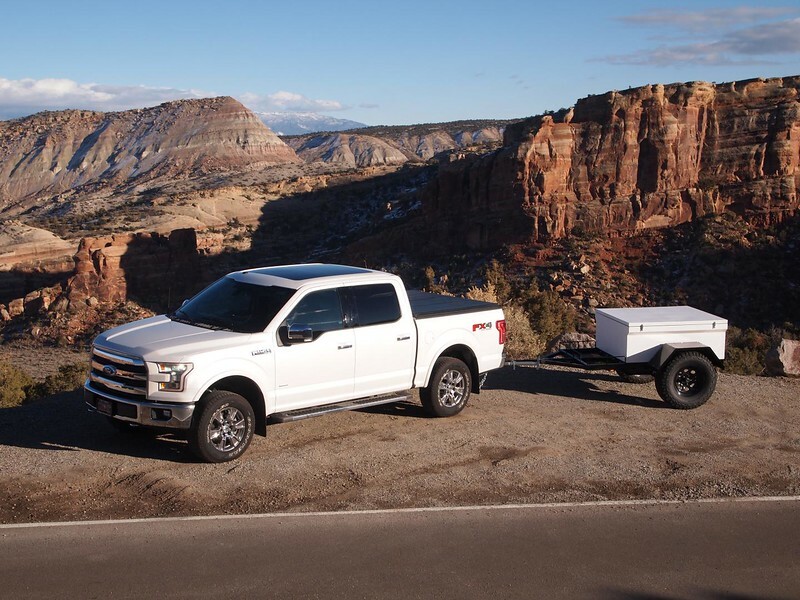 We choose the 3.5L because it has a 12,000 # towing capacity, I don't think we'll ever get close to that rating but I'd rather have plenty of extra capacity then run at close to capacity with the smaller engine. But to answer your question, we have burned thru the 1st tank of fuel and filled it up last week. This was from driving back from SLC, Utah to Grand Junction, CO and then commuting back & forth to work for a couple weeks. 596 miles and an average of 19.6 MPG, according to the trucks computer. Pretty happy with those numbers from the bigger 3.5 EB. I was pushing for running board removal, but the Wife likes them. I'll see if I can take them off temporarily for Baja. We have some upcoming wheel & tire upgrades that I'll be sharing soon, I think they'll look great combined with the Falcon Shocks leveling kit! That's some impressive mileage! Sounds like you're very happy with it, and that's good to hear! They sure are nice trucks. Nice ride! 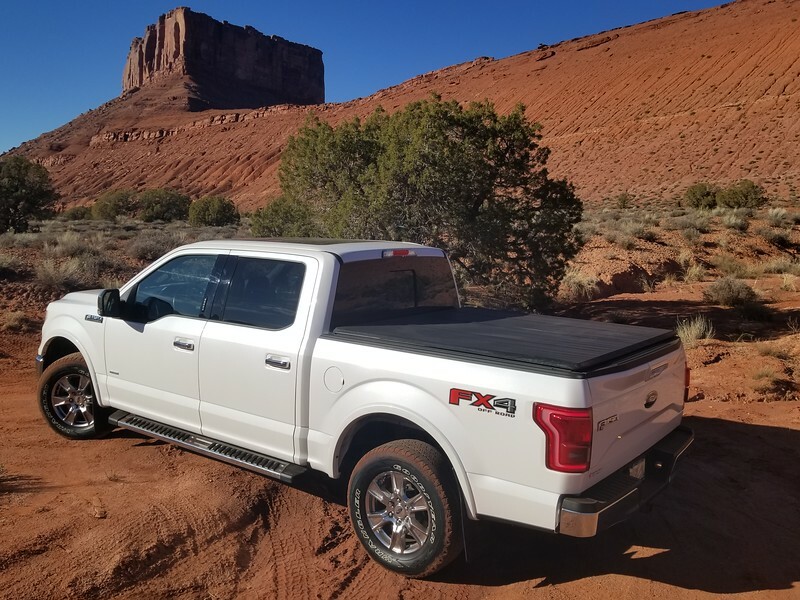 I wish my '17 F150 FX4 w/5.0 had the 36 gallon tank. Maybe the 3.73 gears instead of the 3.55's too . Oh well, it is what it is. I liked your post on the Falcon shock install as well and may have convinced me to changed the way I was going to do my level up. They don't "plummet" under any kind of load. The worst they will do is get about the same MPG while towing as their V8 powered counterparts, while giving far better performance. I have the 2.7 in mine and get about 12MPG effortlessly pulling a camper at 70mph.. my Tundra got nine pulling it at 65 and struggled with every hill. There is a correction factor that you can calculate and enter to make the MPG display more accurate. Run a synthetic oil with a low NOACK rating and change it every 5k (don't listen to the oil life monitor). This will help keep intake valves clean. Brewcity Boost makes some awesome tunes that will give you a significant performance gain, with out trashing your fuel economy.